Reproductive rights activists hail the Supreme Court case as a victory that would result in fewer women getting seriously — or even fatally — injured from abortions. In 1973, the U.S. Supreme Court recognized a woman's constitutional right to an abortion in Roe v. Wade. The landmark ruling legalized abortion nationwide but has been under attack ever since. Who was the plaintiff in Roe v. Wade? The case was filed by Norma McCorvey, who went by the anonymous pseudonym "Jane Roe" in court documents. In 1969, McCorvey, who lived in Texas, was 22, unmarried, and looking to terminate an unwanted pregnancy. But she couldn't: In Texas, it was abortion was a crime unless a woman's life was at risk. Similar statutes were in place in nearly every other state at the time. So McCorvey, seeking to safely and legally abort her pregnancy, sued Henry Wade, the Dallas county district attorney, in 1970. The case went on to the Supreme Court. What was the Supreme Court's decision? On Jan. 22, 1973, the Supreme Court handed down the watershed ruling that a woman's right to make her own medical decisions, including the choice to have an abortion, is protected under the 14th Amendment. What changed after Roe v. Wade? Before the ruling, there were hardly any abortion clinics, since abortion was criminalized in most of the U.S. The Supreme Court's 7-2 decision impacted laws in 46 states. While it legalized abortion during the entirety of pregnancy, it stipulated that states could decide whether abortions were allowed during the second and third trimesters. Reproductive rights activists hailed it as a victory that would result in significantly fewer women getting seriously — or even fatally — injured from abortions by unlicensed providers. Opponents contended it was tantamount to the murder of a fetus. These viewpoints are still passionately held. The decision has never been overturned, but in the years since, hundreds of state laws have been passed that restrict access to abortion and narrow the scope of the ruling, including the Partial-Birth Abortion Ban Act signed by President George W. Bush in 2003, which outlaws a procedure used to perform second-trimester abortions. In 2003, a motion to overturn the ruling was filed with the U.S. district court in Dallas by an unlikely character: McCorvey herself. What became of 'Jane Roe'? McCorvey was five months pregnant when she and her attorneys decided to sue. In June 1970, as the case worked its way through the legal system, her baby was born. McCorvey gave the baby girl up for adoption; the adoptive family has kept the child's identity hidden. For several years after the ruling, McCorvey lived a low-profile life. 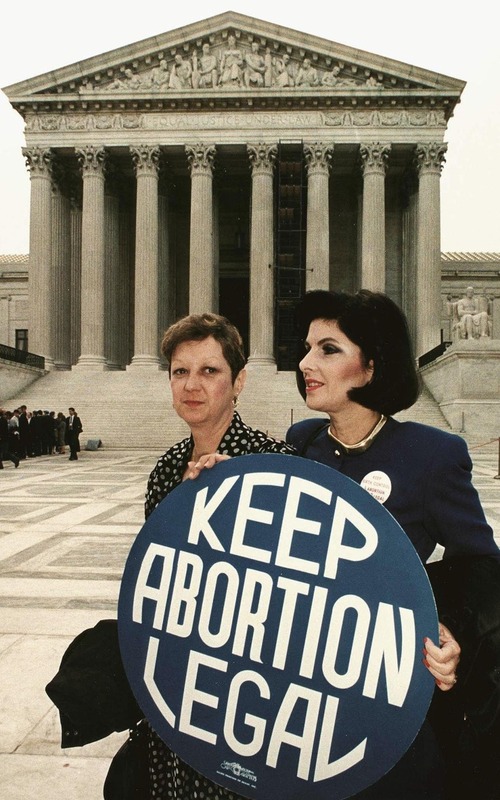 Then in the 1980s, she revealed herself to be Jane Roe, and became an outspoken pro-abortion advocate, even working at a Dallas women's clinic where abortions were performed. She changed her tune in 1995, when a Christian group, Operation Rescue, opened next to the clinic. By 1997, she had grown close with the group and became a born-again Christian, traveling around the country to speak out against abortion. The 2003 motion that McCorvey filed to overturn Roe v. Wade was denied by a federal district court in Dallas that year, then by 5th Circuit Court of Appeals in New Orleans in 2004, and finally by the Supreme Court in 2005. McCorvey died in an assisted living home in Texas at age 69, in February 2017.